Northy in painted stuff SHOCKER! That's about as much tabloid enthusiasm as I can stand, so back to my usual acerbic (lack of) wit. January 30th to March 28th. That's a bloody long time to go without posting anything, isn't it? Ah well, fear not, I've made great use of my time to get some things done. Mostly not painting, admittedly, but I have completed a couple prototype pieces for some armies (Erseta and/or Greyhawk based) with a few more "on the way". 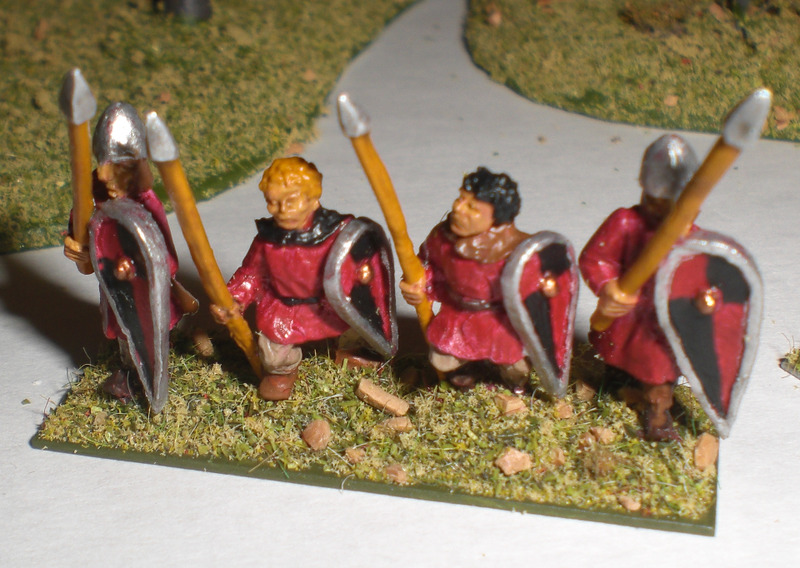 Learned a few things about the painting of 15mm stuff, and considering these are the first ever finished (and based) 15mm chappies I've done, I'm still fairly happy with how they turned out. Actually, I finished some of these a good week ago, but I'm truly terrible at taking pictures and even worse at uploading things in a timely manner. Still, pictures! Do the clicking voodoo doodoo to embigggen the view! 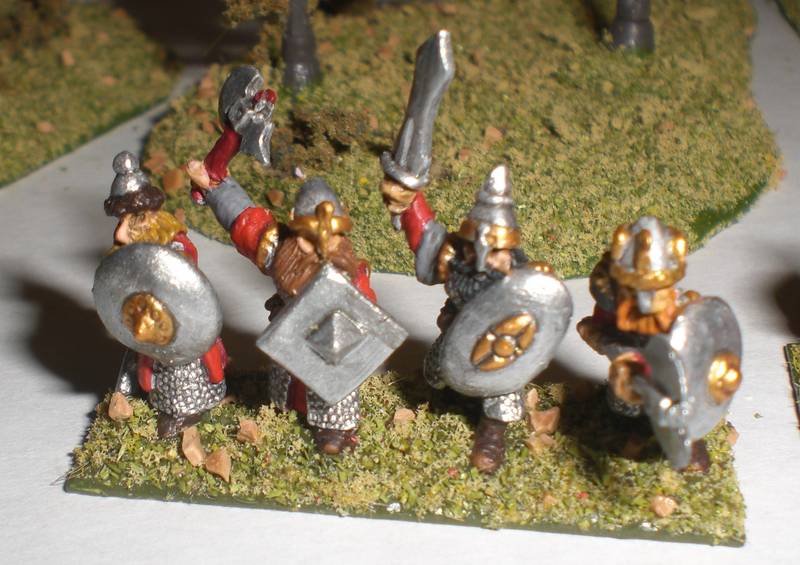 First off, back and front pictures of the (18mm not 15mm) Dwarfs I painted quite some time ago. Finally based, this is actually the battlefield look if/when I get the other bases ready for a battlefield confrontation of some variety. 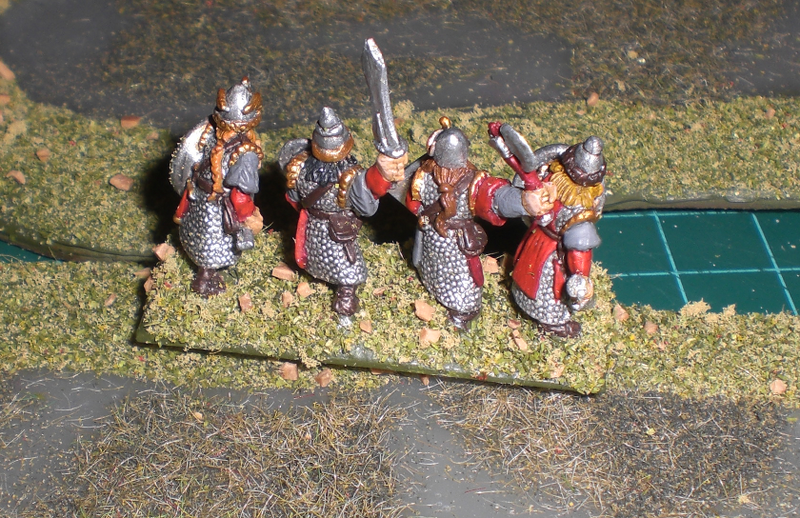 Next up, we have a base of spearmen. Ostensibly they're Vostlander town militia, but they'll do well enough as pretty much any moderately trained spear types in a fetching red and black motif. This base is the one that I learned the most from. Primarily, the learning focused on the need for layers rather than a panacea one-hit ink wash. The inking I used here is far, far too weak for the final result, and it doesn't make the detail hit nearly as well as the figures actually deserve. Sure, they're "good enough" for the battlefield, but I'm certainly going to be doing things slightly differently for the next batch (which might just lead me to revisiting this base to make them match up a tad better to their comrades, we'll see). 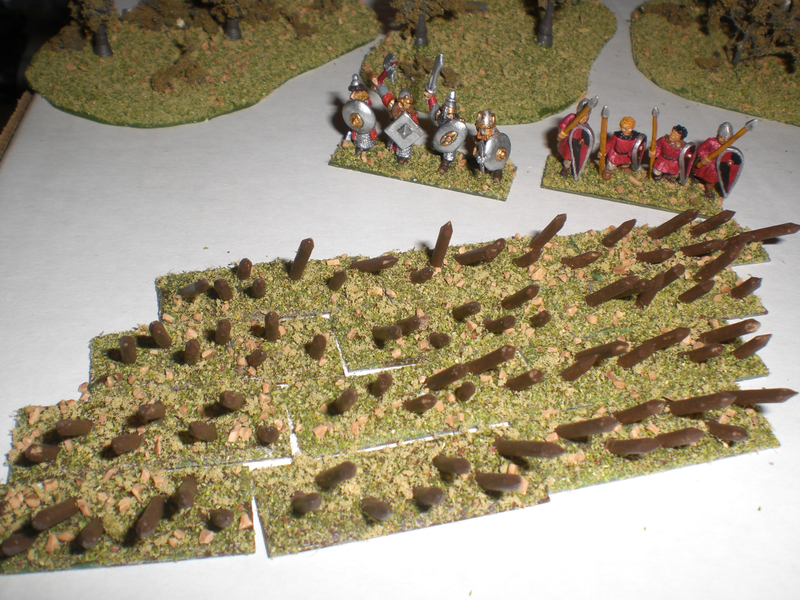 Lastly, a stack of stakes to hide the masses of troops that I have (yet to paint) behind. 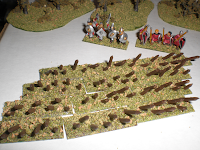 Based in the FoG 15mm style, I bought some thin rigid dowel (roughly the size of matches, only round) and went to down cutting them to length with cutters then whittling the tips to points and bases to a flat angle. I found that applying some green stuff to the metal bases helps seat the stakes more solidly and also gives a better looking surface rather than the oddly two-dimensional look of plain metal. Still, let me tell you, these bastards work VERY well as caltrops versus my feet. Next most likely to be finished is the prototype heavy gun base that's 90% done, or, muse permitting, possibly a 28mm D&D figure of my darling wife's superstrong fighter, or even a Wehrmacht-themed Ogre Mk.III.